U.S. Attorney General Michael Mukasey & Rabbi Levi Shemtov light the first candle of Chanukah on the (so-called) “National” Menorah on the White House Lawn, Dec. 4 2007. — “An inward zeall they had of propagating the gospell of the kingdom of Christ in those remote parts of the world.” — History of Plimoth Plantation, Governor William Bradford. HOW CAN WE STOP THE JEWS FROM JEWIFYING AMERICA? 1) Whenever you see a Chanukah Menorah in a public area, demand that a Nativity Scene be put up next to it. 2) Start putting up Crosses on private properties, both residences and businesses, in order to show the Jews that America is a Christian nation - not a Jewish one. 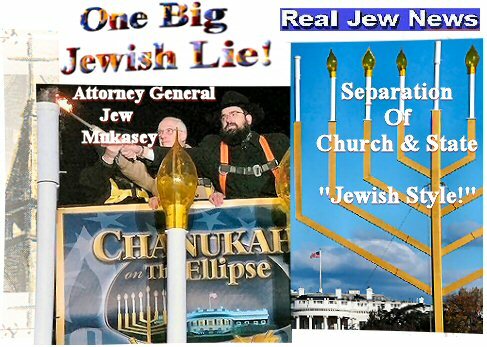 3) Demand that Jews like Attorney General Michael Mukasey keep his Anti-Christ rabbi friends off of the White House Lawn & out of the Oval Office! Since Jesus Christ is God Almighty, equal with the Father, and the Holy Ghost, and since Jesus created all things ( seen and unseen ) we all have a duty for being created, to honour Him. This includes the state. The true Religion ( Catholic Church ) must be honoured by the state. An example of this was Franco of Spain. He was a great Catholic who put the Church first, and the state second. Read the good Brother’s Jewish Murderers of the Spanish Civil War. This is a fantastic article! Read Ed of St. Lou’s comments also. Father Denis Fahey gave the true Catholic teaching that the state needed to honour the Church under the banner of Christ the King. All of Fahey’s books are a must read. Michael Davies wrote a book “The Second Vatican Council and Religious Liberty.” He explains how the teachings of the false Vatican two Popes, and Vatican two on this subject are false teachings. He explains that the state has the obligation to never separate from the true Relgion, which it should always and everywhere honour. The is one teaching that many will perish into the Fires of Hell for falsely promoting error/heresy. Many scholars have explained in writing how Jews, Protestant’s, and Modernist’s took over the lead of running the Vatican Two Council and what would be put into writings for future generations of Catholic’s to believe. The bottom line is the Christ the King doctrine was overthrown, and Jews had a lot to do with this destruction of a Catholic belief! There is so much confusion about America, if it was founded as a “Christian nation” or not. One can ask the first several generations of black people brought to this country. One could ask any generation of Native American. They all dealt with Bible toting clergy who used the Bible to defend their oppression, and subjugation. This is what is so traditional in Christian history, as what the founders knew. Religion and government don’t mix; they corrupt each other, as Christian history dictates again and again. As to slavery the Protestants were on both sides. Northern Baptist, using scripture, and ‘led’ by the spirit fought against slavery. Southern Baptist, using scripture and ‘led’ by the spirit, fought for slavery. Today the Baptist still divided between north and south. Someone is confused. Through far, far less religious strife happened in this country than ‘Christian Europe,’ there were exceptions. Some violence by Protestants against Catholics and Jews, the vicious persecution of the Mormons. The sectarian ‘Christian,’ be he Catholic or protestant has offered what can be called a ‘mixed bag’ in the last two centuries. The right bans a book for being, ‘Godless’ and the left bans a book for being ‘politically incorrect.’ At the end of the day, it’s the same thing. As a libertarian I despise both the anti-freedom agendas of the Theo-fascist fundamentalist and the rabidly-secular-socialist left. The Founders, I suspect would spurn both as well. Let them speak for themselves; getting beyond the rhetorical haze. As I see it the Founders were no more secularist than they were Fundamentalist. Both secular people and fundys claim the founders represent them, both are wrong. I go straight to their own words to cut through the rhetorical haze. Secular people claim the founders wanted separation of church, and all religion from public life, that is nonsense. Fundys claim they wanted a Christian nation, if not a theocracy, more nonsense. “(When) the (Virginia) bill for establishing religious freedom, the principles of which had, to a certain degree, been enacted before, I had drawn in all the latitude of reason & right. It still met with opposition; but, with some mutilations in the preamble, it was finally passed; and a singular proposition proved that it’s protections of opinion was meant to be universal. “When a religion is good, I conceive it will support itself; and when it does not support itself, and God does not take care to support it so that its professors are obliged to call for help of the civil power, ’tis a sign, I apprehend, of its beginnings. “God alone is Lord of the conscience, and He has left it free from the doctrines and commandments of men which are contrary to His Word or not contained in it. Church and state should be separate. The state owes to every church protection and full freedom in the pursuit of its spiritual ends. In providing for such freedom no ecclesiastical group or denomination should be favored by the state more than others. Civil government being ordained of God, it is the duty of Christians to render loyal obedience thereto in all things not contrary to the revealed will of God. The church should not resort to the civil power to carry on its work. The gospel of Christ contemplates spiritual means alone for the pursuit of its ends. The state has no right to impose penalties for religious opinions of any kind. The state has no right to impose taxes for the support of any form of religion. The Senators and Representatives before mentioned, and the Members of the several State Legislatures, and all executive and judicial Officers, both of the United States and of the several States, shall be bound by Oath or Affirmation, to support this Constitution; but no religious Test shall ever be required as a Qualification to any Office or public Trust under the United States. (emphasis added) United States Constitution. It’s true that this represents only 27% of the total signers. But this 27% included the principle movers of the Revolution, most notably Benjamin Franklin and Thomas Jefferson, the primary authors of the Declaration. The former was a Freemason, the latter a deist and possible Freemason. If one were to analyze the Declaration, he would see the humanistic influences. In any event, there is no evidence that even 27% of the signers were true Christians. Without the concept of a SEPARATION OF CHURCH & STATE, you can be told what to do/what not to do by the govt. regarding not only your faith or lack thereof but when and how you are allowed to work or worship. It’s already happened in America and those in power want to do it again bigtime. There are some things that are not specifically enumerated in the Constitution yet nonetheless are there in meaning and/or implied. Rights for instance- If one takes an ignorant and myopic view of the fact that the rights of marriage and procreation and the right to travel and a number of other such rights are not exactly listed in the Constitution & Bill of rights then one could say that individuals don’t have those rights. YET OF COURSE WE DO! Read the 9th and the 10th Amendments to the Bill of Rights and see that other rights are covered and can’t be assumed by the govt. that they are not rights. The founding fathers wanted to put a stop to the bickering between catholics and other religions as to which denomination was to be the American religion, they were adament that NO religion should be allowed to be called the state religion! Of course, in my waking up to the New World Order I’ve noticed that there is a religion that does pretty much get away with running things. It’s not one you’ll find listed in the phonebook–the ILLUMINATI (and the Illuminati is not comprised of all jews or zionists) It greatly behooves anyone who truly loves freedom/individual liberies to support the concept of SEPARATION OF CHURCH & STATE The Seventh-Day Adventists do and they have it right. Adventist writings suggest that when church and state unite in the United States of America, the antichrist will come and lead the union. “The separation of Church and State is not meant to hinder religion, or to deny the role of religion in society or in our history. Many of the founders were Christians, even James Madison was a Christian, but what they established was a government that was non-religious - a secular government. That does not mean that they rejected religion; their purpose was to establish a government whose sole function was to administer earthy matters, while matters of religion were left purely to ecclesiastical institutions. Freemasons are of Phariseeic orgin (perfidious Jews like Herod and Herod Jr., and inventors of Communism) in which they detest the Christian Church. America is based on Christian doctrine (Christopher Columbus and the Jesuits martyred for the faith were Catholics). The perfidious hated Catholic JFK also and considered him a monarch to be assassinated to begin their lies in the State. They’d already assassinated Pope Pius XII so they could introduce all their lies in the Church. “You are of your father the devil…” (John 8:44) and “Beware of those who call themselves Jews and are not…but are the synagogue of satan.” (Apocalyse, Revelations to St. John, 2:9, 3:9). I am pastor Nahum A Khawar Founder and Chairman Prayer Fellowship Ministry of Pakistan. For he shall have judgment without mercy, that hath shewed no mercy; and mercy rejoiceth against judgment. What doth it profit, my brethren, though a man say he hath faith, and have not works? Can faith save him? and He said unto them, which of you shall have a friend, and shall go unto him at midnight, and say unto him, friend, lend me three loaves; for a friend of mine in his journey is come to me, and I have nothing to put before him? And he from within shall answer and say trouble me not: the door is now shut, and my children are with me in bed; I cannot rise and give thee. You are brother of the Lord our God and welcome to Pakistan…. Jews seem to be the Chameleons of the planet that crawl and change their stories to suit the polictical needs and climate and the dollar. They change their colours and camouflage their intent to own every step they step on this planet and control our thoughts with their media powers. We are basically fodder for them, below them and to serve them as the master race. The engineers of Ukraine’s Genocide HOLODOMOR 7 million starved and executed under the Jewish team of commissars of Stalins Central committee, 14 years before the Jewish holocaust. Rothschild financed the war machine that supported the Russian revolution — Lenins bank ! That intimidated the Ukraine into submission by starvation and the barrell of the guns that Rothschild supplied, tanks etc. Anything that would satisfy his hunger to destroy the Czar and the white armies imperialist regime. The Jewish pogrom revenge that wiped out millions of innocent Ukrainians and their children by colletivizing their farms and barricading them in their own villages with Red Army and GPU Secret Police the predessors of the NKVD and KGB. HOLODOMOR, folks. It’s getting bigger on the web. Google it and set the truth free in your lives. I’m looking for an investor for my screenplay of this Ukraine genocide as an action film. Maybe a Jew willing to tell the truth. 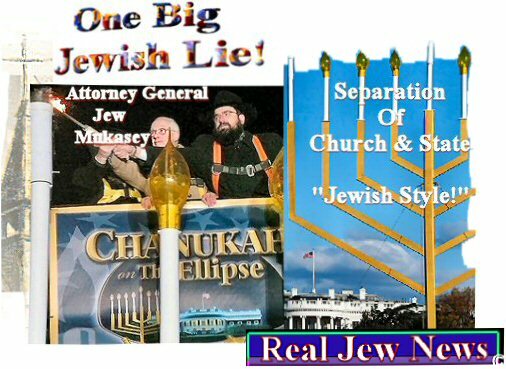 Thousands of eye witness accounts are on record and books; one by a Jew too from Ukraine Vasily Grossman who testifies the truth — Jews have the guts he had and might call a spade a spade. I love all races, but will not tolerate dictators and conspirators to domoinate the world. The fanatics of Zionism ! In the name of our - separate - Constitutional Republican Mortal State and Liberal Democratic Mortal Society - and Nonviolence, avoiding aggression, and Nonsinning, avoiding harm to others - the Kami (Gods) and Megami (Goddesses) of All Faiths do not care about the Mortal State… that is the Problem of us Mortals. Blessings of the Buddha, the Tao, the Kami, and the Megami from this humble little Shinto Shamaness to Everyone of All Faiths who Believe in Nonviolence and Nonsinning! Cheers! You are always right-on, Brother Nathanael.